He was a performer par excellence. My earliest memory of Vinod Khanna dates back to my childhood, when I would flip through the pages of my father’s carefully maintained Filmfare magazine issues dating back to the 1960s. My father used to be a huge fan of Hindi films, and I would later discover an autographed picture of Vinod Khanna from his study one day. Then, he confessed how he was a fan of Khanna through his college days, which coincided with Khanna’s peak, and how he would be inspired by Khanna in his choice of attire and hairstyle. One of the first Hindi films I remember watching in my childhood was Ravi Chopra’s The Burning Train (1980), which was a multi-starrer with Dharmendra, Jeetendra ,Vinod Mehra and Navin Nischol, of course, apart from Khanna among the male leads. Despite Dharmendra’s seniority, Khanna was the de facto hero in the film, playing engineer Vinod Verma, the author-backed-role that he performed with finesse. Till date, it remains one of my favourite Hindi films, and when I later came to know that it had an average run at the box office, I could hardly believe the fact. In fact, I don’t think there’s another film apart from Sholay, from that era, that could have been so technically advanced. I also remember watching many of his films on Friday/Saturday nights on Doordarshan during my school days, ranging from blockbusters like Amar Akbar Anthony, Parvarish, Muqaddar Ka Sikandar to Dayavan and Chandni. It is remarkable how he held his own in multi-starrers, especially with Amitabh Bachchan in his prime, and Dharmendra, towards the latter part of his career. He had tremendous screen presence and charisma, and it’s a shame that he took a sabbatical at his peak in 1982 for five years. Khanna got his first break in films through Sunil Dutt in Man Ka Meet in 1969 and went on to play character roles and the antagonist in many films. It was Gulzaar’s Mere Apne in 1971 that turned around his career, and soon he became a leading hero. Vinod Khanna with Parveen Babi in The Burning Train. By 1972, he was an established star in his own right and his performance in Gulzaar’s Achanak (1973) was as talked about that year as Bachchan’s in Zanjeer and Rishi Kapoor’s debut in Bobby. Many people do not know that his association with Osho Rajneesh began much before his sabbatical. He was initiated into the cult as early as 1975 and by the end of 70s, he would spend the weekends at Osho's ashram in Pune. As Osho had to shift to the United States in the 80s, Khanna decided to quit the film industry and moved to Oregon in the US to join his "guru". He called a memorable press conference at Centaur Hotel in 1982, to address a stunned gathering with the announcement that he was quitting films altogether. His wife Geetanjali and sons, Rahul (8) and Akshaye (5), were by his side and he disappeared from limelight after that for a period of five years. I also recall reading in an interview that the toughest decision he had to make in life was to return to India in 1987, to resume his career and saying "No" to Osho when he was asked to take care of the Pune Ashram after his return. According to many people, if he hadn’t quit the film industry at that crucial time, he could have given Amitabh Bachchan a run for his money as he was the only contemporary who managed to hold his own with Bachchan in the frame. 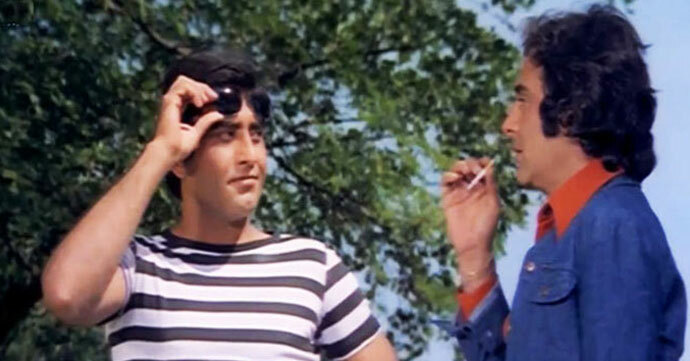 Although he played what could be described as "second lead" in many films with Bachchan, Khanna somehow ensured that he got an equal share of the pie. Can anyone forget that famous scene in Amar Akbar Anthony (1977), where a fight sequence between Amar (the character played by Khanna) and Antony (Bachchan) culminates with Bachchan falling unconscious and Khanna carrying the 6-foot-3-inch giant on his shoulders? That one scene will linger on in anyone’s memory even if you have watched the film just once. After making a comeback in 1987 with back-to-back hits, his career got a second wind when Feroz Khan cast him as the hero in the 1988 superhit Dayavaan with Madhuri Dixit as the female lead. That performance was hugely appreciated and Chandni (1989) directed by Yash Chopra was also a blockbuster in the latter part of his career. He launched his younger son Akshaye as a hero in 1997, shortly after his own career as a lead hero came to an end in the mid-nineties, and in the same year, he joined politics. In 1998, he contested as the BJP candidate from Gurdaspur and defeated the incumbent five-time Congress MP to win the election. He retained his seat in 1999 and 2004. In 2002, he was made the minister of state for tourism in the Atal Bihari Vajpayee’s government and then had a stint as the junior minister in the external affairs ministry. He lost his seat in 2009 to Congressman Partap Singh Bajwa by a slim margin of less than 8,000 votes, though he avenged his defeat in 2014 by trouncing the latter with more than a lakh votes. Millennials — who may have watched Khanna only in films like Wanted and Dabangg — could watch his films like The Burning Train or Qurbani to realise his calibre as an actor. He was a performer par excellence.